The first baby of 2014 at Saint Francis Medical Center, Jason Matthew, is welcomed to the world by proud parents Matthew Lincoln and Caitlin Cook of Marble Hill, Mo. Saint Francis Medical Center celebrated the delivery of its first baby in 2014. 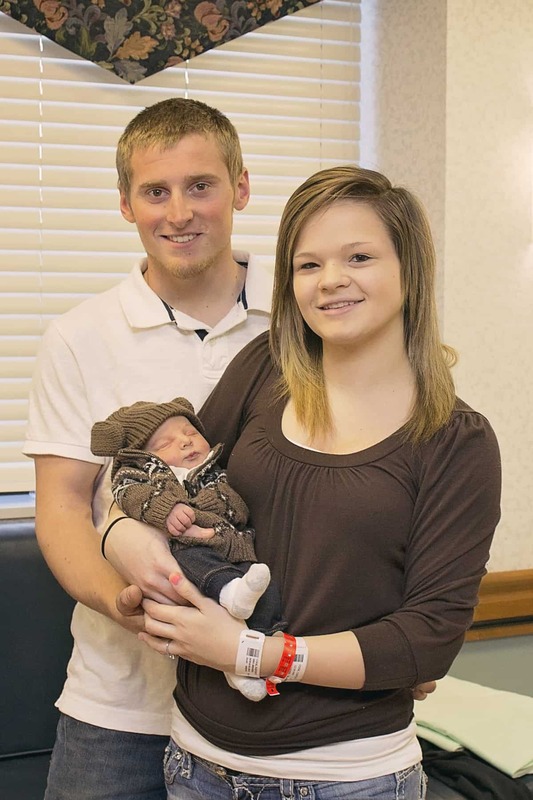 At 1:22 pm on Wednesday, January 1, 2014, a baby boy was welcomed into the world by proud parents Caitlin Cook and Matthew Lincoln of Marble Hill, Mo., and caring Family BirthPlace nursing staff. Kimberly K. Roos, MD, FACOG, obstetrician/gynecologist at Cape Care for Women, delivered 7-pound, 9-ounce, 19-inch Jason Matthew. To further welcome the new arrival, the Medical Center presented the family with a special basket of baby items. The Family BirthPlace nursing staff recalled many unique names given to children throughout 2013, but some names appeared more often than others at the Saint Francis Family BirthPlace. For girls born at Saint Francis in 2013, the most popular name was Zoey; and for boys, Hunter and Jaxon. These names were followed closely by Abigail, Chloe and Sophia for girls, and Bentley, Ethan and Carson for boys. Names new on the list for 2013 were Kori, Lyric, Paisley and Sequoia for girls and Alistair, Bo and Memphis for boys. Consistent with national trends, some babies born in 2013 were named after celebrities and popular television show characters, including Jase (from “Duck Dynasty”) and Jesse (from “Breaking Bad”) for boys and Aria (from “Pretty Little Liars”) and Skylar (from “Breaking Bad”) for girls. The Family BirthPlace ended the year with 1,030 deliveries, including 24 sets of twins – five sets born a single week in October alone – and one set of triplets. A monthly record was set in July, with 105 deliveries.